All-American lacrosse player Nick Karnes wins a face-off against Onondaga Community College last season. Karnes will not return to AACC in 2019. AACC’s only first-team All-American athlete will not return to Men’s Lacrosse this spring. 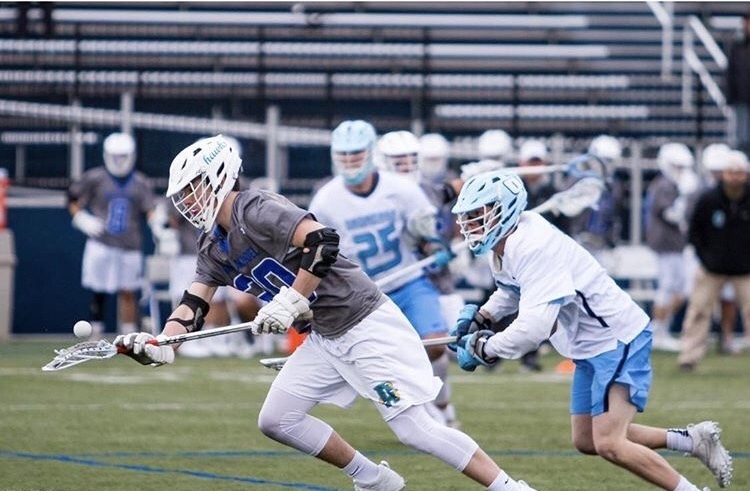 Face-off player Nick Karnes, who earned All-American honors from the National Junior College Athletic Association last year, said he is unable to redeem his position this spring because he didn’t meet the academic requirements to play. But Karnes said he enjoyed his time at AACC. “I made great friends and liked all the coaches,” Karnes said. Karnes, who lives in Warrenton, Virginia, said his best memory at the college was his first game against Onondaga Community College, when he faced off against a player who went on to play lacrosse at a Division I university. His teammates said they admired his dedication to the game. Charlie Ellis, who also played with Karnes before transferring to Guilford College in North Carolina to play lacrosse, agreed. Others agreed Karnes was a star on and off the field. Walsh and Payne left AACC to play lacrosse at Newberry College in South Carolina. The Athletics Department created a position late last year for an academic adviser who will work exclusively with athletes (see related story, Page 19). “I think that’s awesome and will help players tremendously with their school work,” Karnes said.